The Apple Store, a subsidiary of Apple Inc. was founded in 2001. At the time there are 412 stores in 14 countries. The Apple Store is managed by Tim Cook (CEO) and Apple’s Phil Schiller as the director for marketing. To seamlessly buy Apple products every iOS device comes with the pre-installed app Apple Store. The app can be connected with your Apple ID and requires some additional information about your banking account to purchase products. A large percentage of people learn from pictures rather than words. When it comes to sales offers nearly all of us first want to get an impression of the product before going into the details. 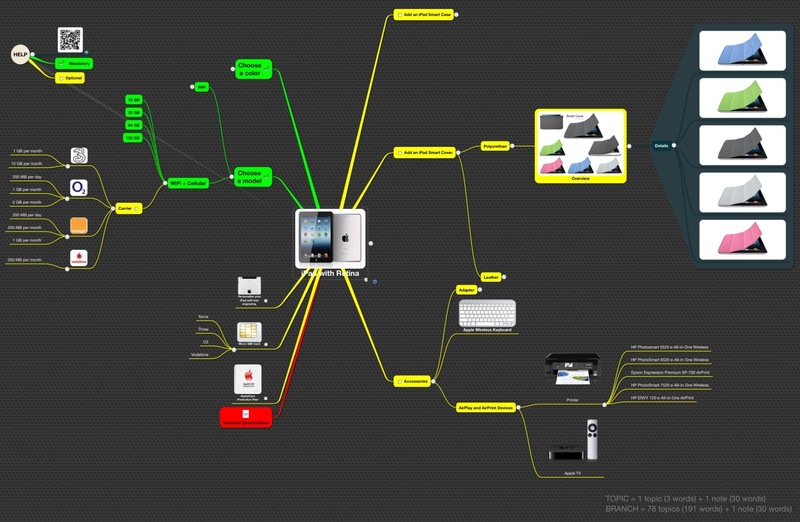 I would like to show you an alternate approach to an array of products by using a mind map. 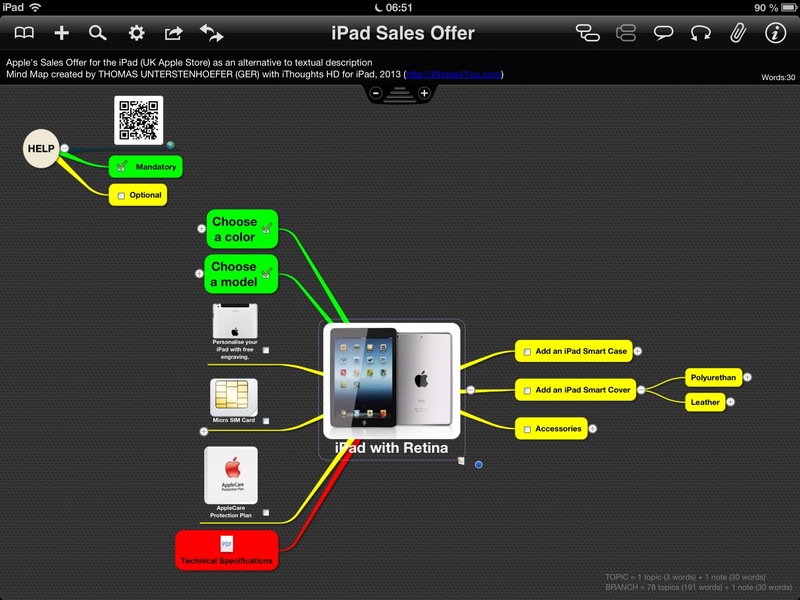 The mind map was created with the mind mapping tool iThoughts HD for the iPad and shows the offer of the Apple Store, UK, of July 2013. To choose products and get information you have to move through different screens with images of the product and textual descriptions in general and more detailed. Buying a device in the Apple Store starts with the selection of a specific model. Images and graphics that’s what gives it the extra something to attract potential customers. This is particularly valid for products perfectly designed and finished with high quality materials. 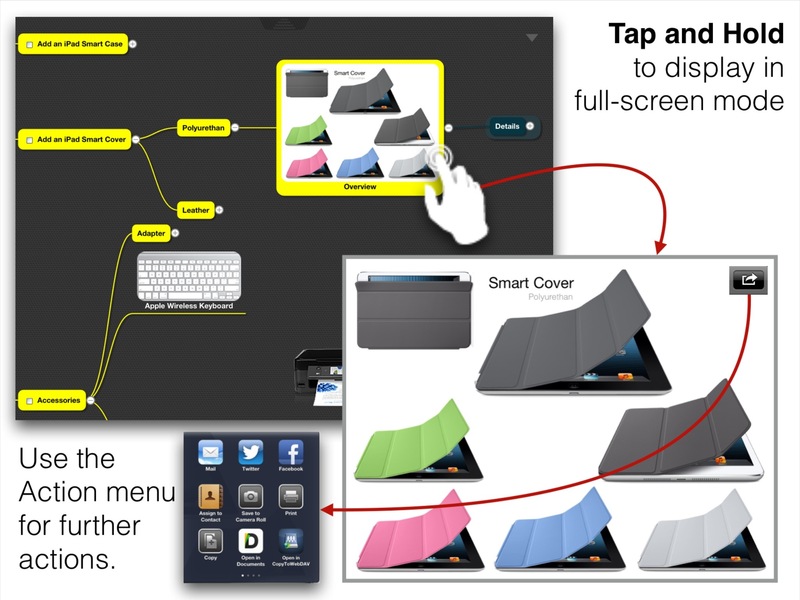 Let me illustrate this important point for a useful and innovative accessory, the Smart Cover. This part of the mind map uses two topics, an Overview for quick information and comparison and Details for seeing the details and purchasing a variant. With the Tap + Hold gesture images can be displayed in full-screen mode. Further actions allow to use the image for other purposes. 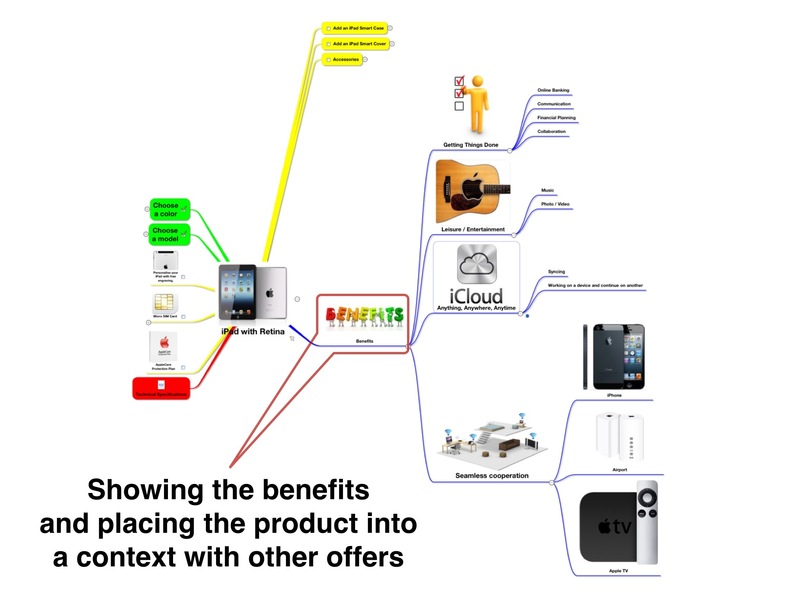 Exploring the product offer with a mind map is much more interesting than doing it by reading just text. It’s the graphical interface which makes the difference. 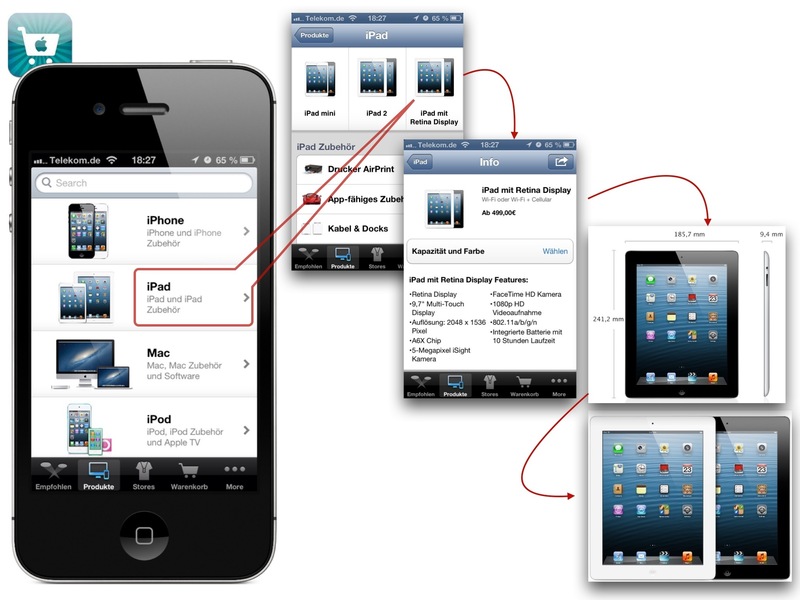 The whole offer divided into main topics (=products and services) is always visible and navigation is done by a fingertip in contrast to the hierarchical structure of the app Apple Store where you have to dive into the details and then trace back the hierarchy to explore other products. 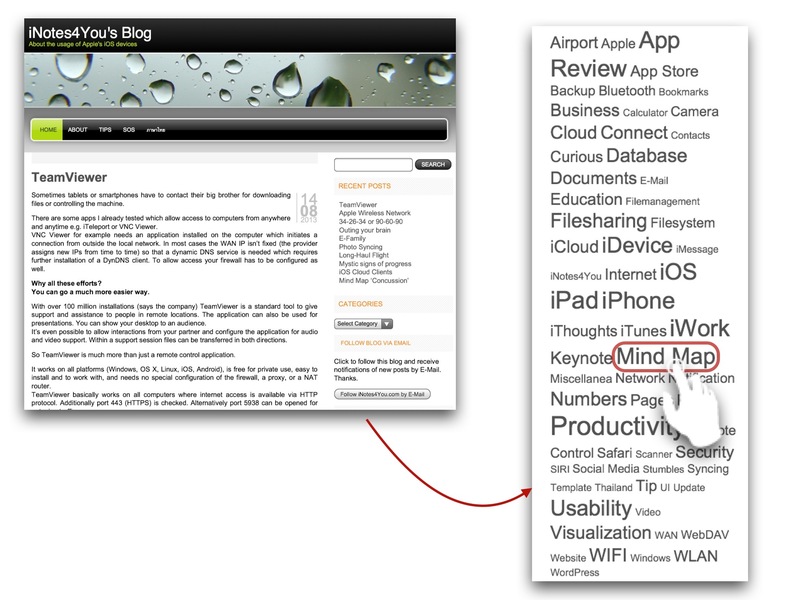 Within a mind map just tap on the Collapse Control (-) and you are back on level zero with the products overview. 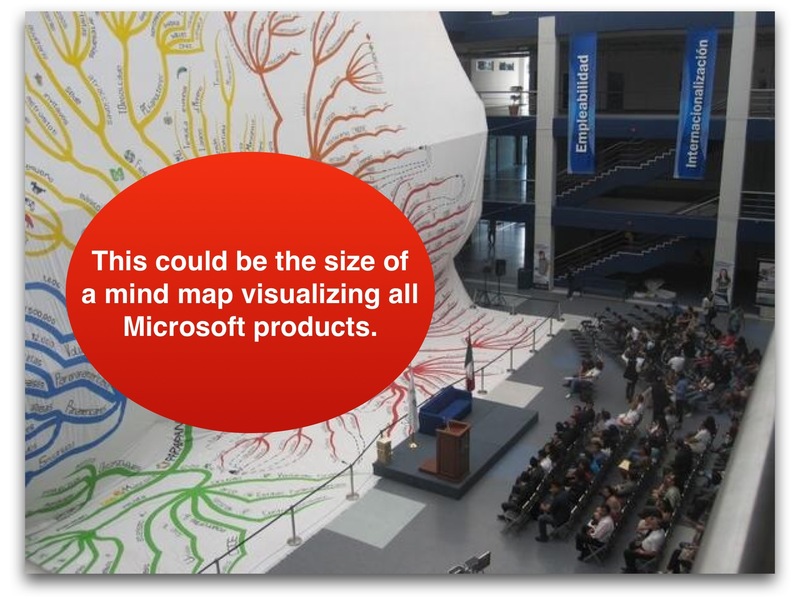 Nearly all mind mapping tools provide a Search functionality. A term or part of it can be entered and the hits are displayed in a list. Tapping on an item opens the related topic. This cannot be done seamlessly on Apple’s website. You always have to scroll up and down, tap on links, and return to the basic site. 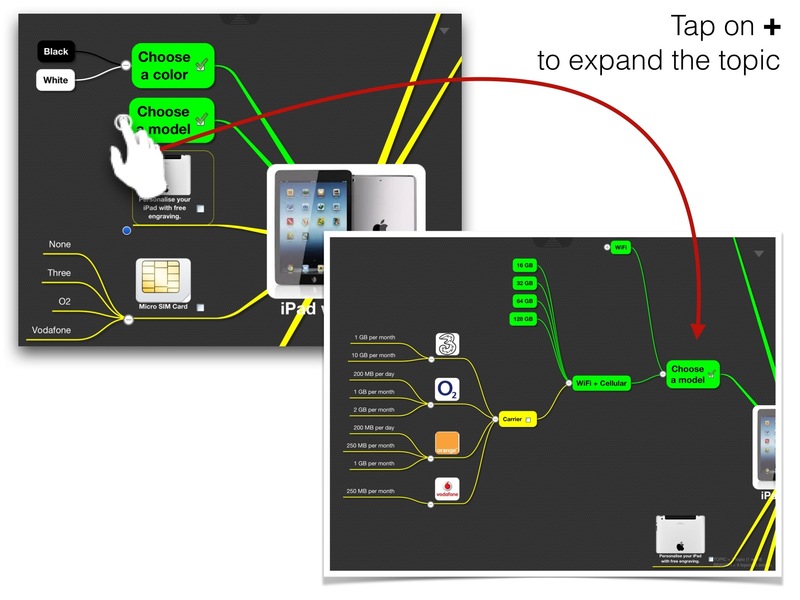 The classical app allows zooming only for images whereas the mind map can always be zoomed by using the two fingers. Pinch two fingers together to zoom out or spread them apart to zoom in. 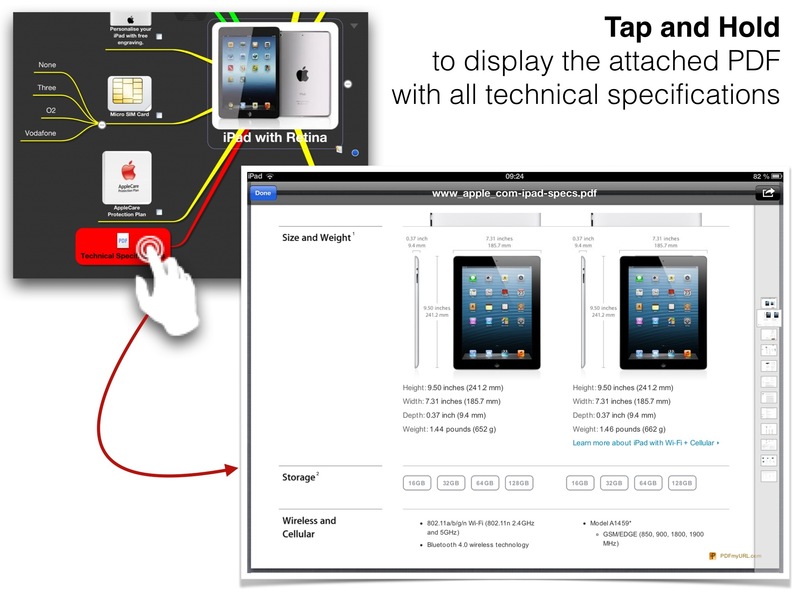 For comprehensive technical descriptions PDFs should be attached to a topic. for a detailed description how to convert any website into a PDF file which than can be easily added to the mind map by using the ‘Open in’ command from within Safari and selecting iThoughts as the destination app. Mind maps need a lot of space if all topics are expanded. So a meaningful usage is limited to tablets and computers. Steve Job’s philosophy was to focus on some products. So my suggestion for an alternate store wouldn’t work with Microsoft products. A special functionality is needed to mark products you want to purchase and put them in a shopping basket and an outlined list on the left side of the screen. This new feature is no standard functionality of mind mapping tools but of course it could be implemented in an extended mind mapping tool. An alternative could be to hide topics which are not of interest. The remaining products are automatically moved into the shopping basket. You might argue that I present an alternative for buying in the Apple Store but the user yet doesn’t have the device he is looking for and so cannot use this mind map. Well, mind maps can also be used on websites. 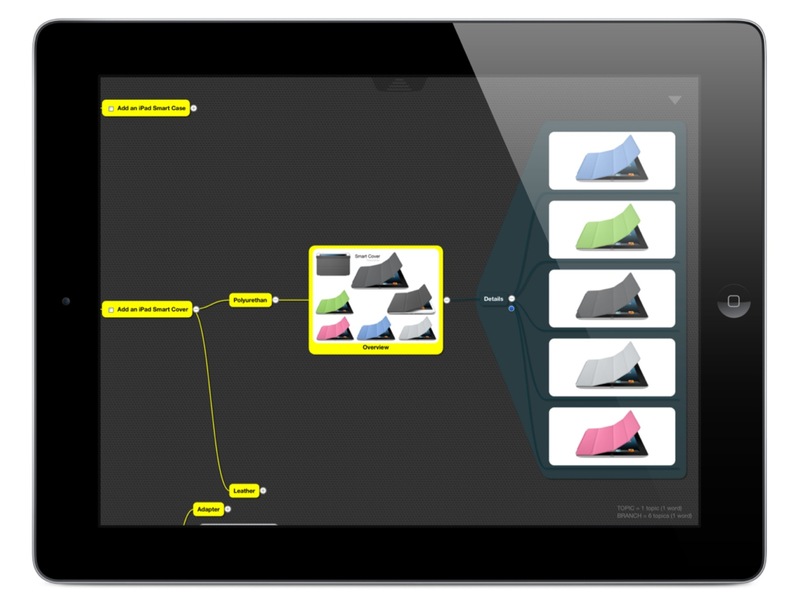 Mind mapping tools like iThoughts HD for the iPad for example allow the export of a mind map in the so-called HTML+PNG format. When using this format a website is created and it contains so-called Hotspots which are clickable. So even on websites it’s seamlessly possible to use all the benefits of visualized information. Well-crafted mind maps can liven up any sales offer because they can let the clients see how the product or service can actually benefit them. So a mind map for sales offers should not just present the facts but also some examples of applications and an overview how the actual products fits in the vendor’s ecosystem. Here are some suggestions how the actual mind map could be extended to cover the idea of improving sales by showing potential customers something more than just the product. A slightly increasing number of web services offer mind maps as the main navigation and for visualizing summarized contents e.g. Vizify for displaying bios. It might be a problem of programming languages for websites, performance issues, and the display of unavoidable advertisement that hamper an intense usage of this technique. My blog offers a so-called Keyword Cloud on the right side. Just tap on ‘Mind Map’ to retrieve more articles about mind mapping here on iNotes4You.